In this article you will learn the best way to play Blu-ray ISO on Windows 10, and you will get the best Blu-ray ISO player for Windows 10. UFUWare Windows 10 Blu-ray ISO Player is the best solution for your computer Blu-ray ISO playback problem considering Blu-ray has become more and more popular nowadays. 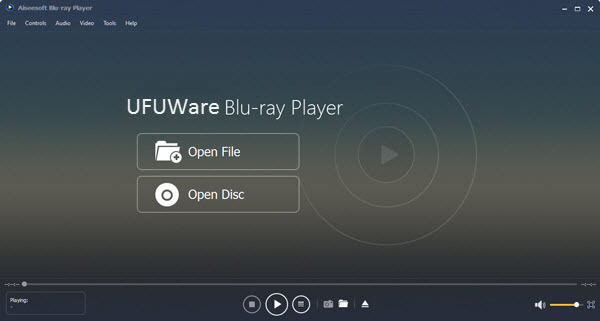 UFUWare Windows 10 Blu-ray Player is able to play Blu-ray Disc, Blu-ray ISO file, or BDMV folder on Windows operating system successfully, no matter with BD+, or AACS. Apart from Blu-ray media format, it can also play MXF, MTS, M2TS, MOV, MKV, AVI, FLV, WMV, MP4, MPEG, RMVB, MP3, WMA, AAC, AC3, etc, on Windows 10/8.1/8/7/Vista/XP platform. Supporting High resolution up to 1080p and DTS audio system guarantees amazing audiovisual enjoyment with high quality. Now I will show you how to enjoy Blu-ray ISO image files on Windows 10 with this Windows 10 Blu-ray Player step by step. Tips: To enjoy the Blu-ray ISO images on Windows 10, you need to install a virtue Blu-ray drive on your computer first. Any customers can easily download the Blu-ray ISO Player Software on official website for free. Then users can install the application on your computer. Then click the “Open Disc” button to open a browse window where you need to find the virtue drive on your Windows 10 PC. Besides of enjoying the Blu-ray ISO on Windows 10 from the beginning, users can also choose to play the specific Blu-ray title or chapter by right-clicking on the playback screen. Also this Windows 10 Blu-ray Player allows users to define the audio/video track, audio channel, playing screen size, and so on.